In May 2016 we drove across Spain and over the Pyrenees into France to get in some hiking and enjoy pristine landscapes. This time we were going a bit further east. 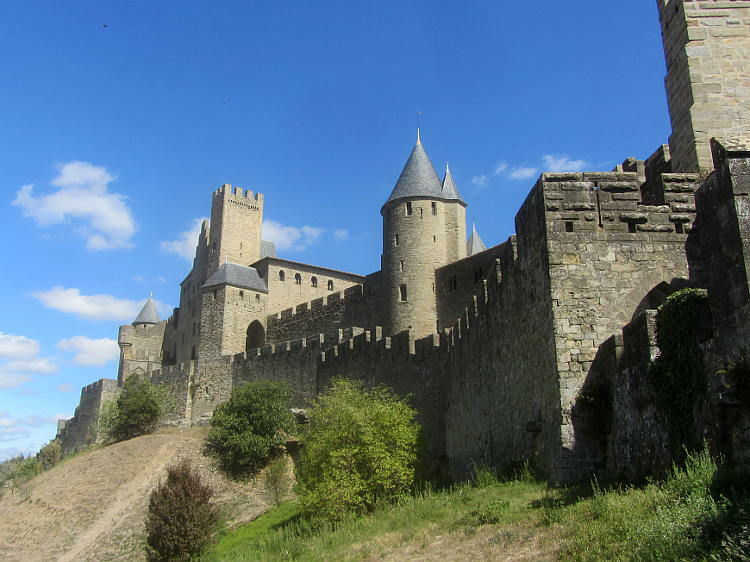 We hoped to see more of the Pyrenees but also to explore its medieval past, dip our toes in the Med and to forge on to the greatest medieval fortress city of the area, Carcassonne. 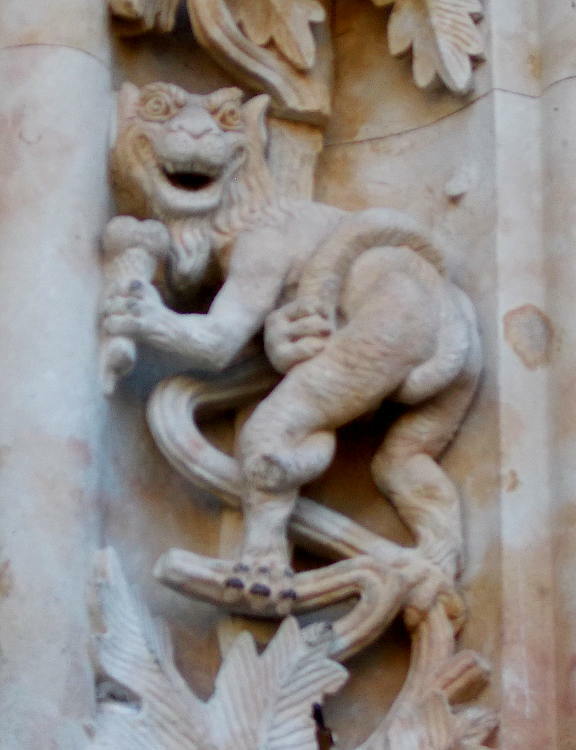 But first of course, leaving our home in Portugal we had a fair bit of Spain to get through. 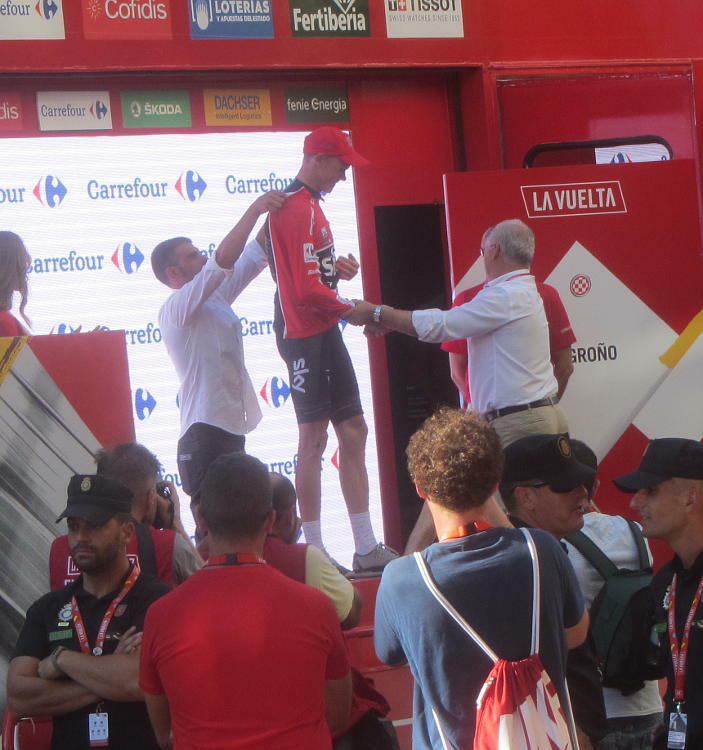 As it happened our holiday coincided with La Vuelta de Espana and in fact our paths crossed in Legrono where we saw Chris Froome and the peloton in the time trial. 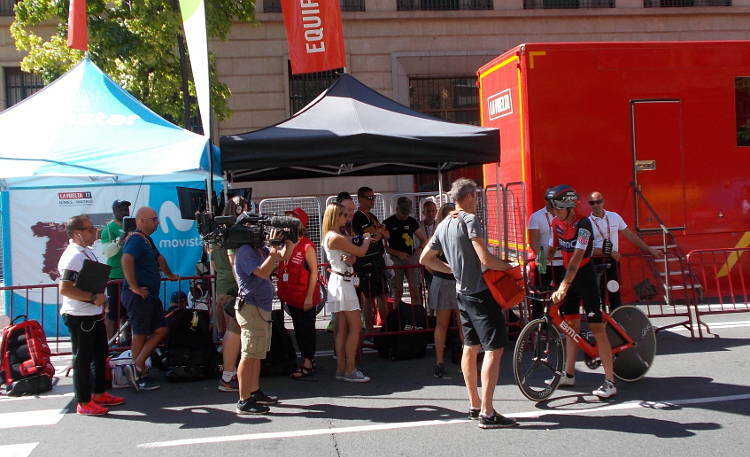 We found a great spot on the last corner but unlike in 2014 where we were spotted on TV in the Asturias, this time the cameras missed us. 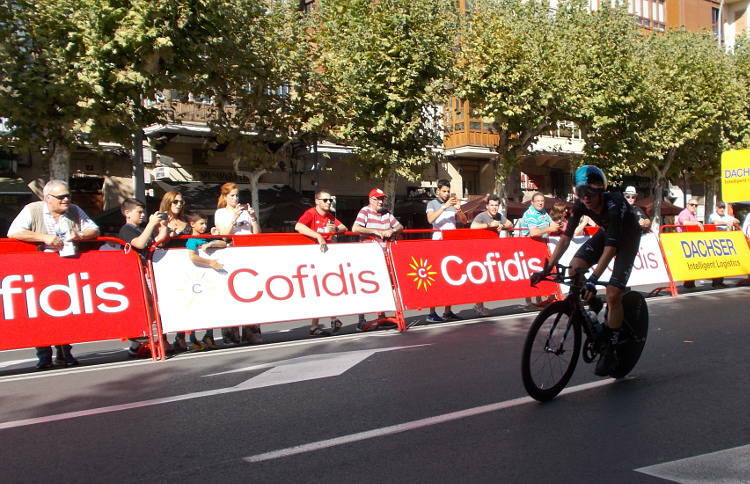 Apart from the excitement of the Vuelta, Legrono is worth a visit in its own right. 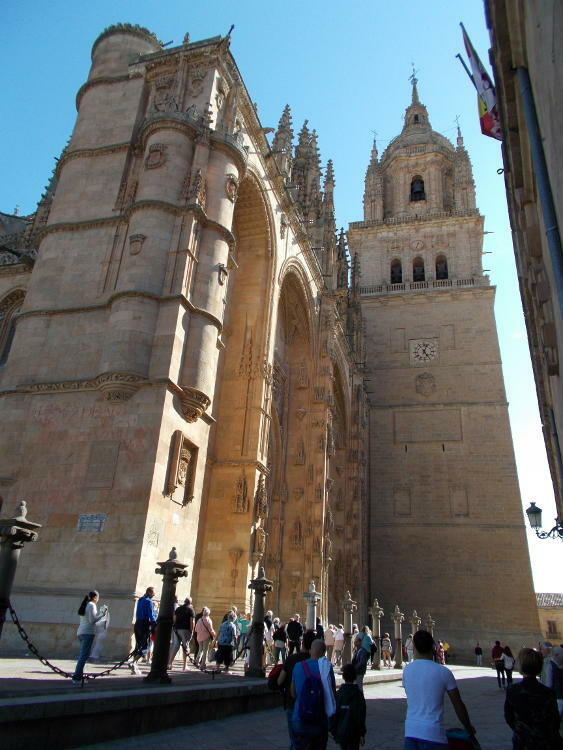 The old town is very attractive with a huge central square and of course a beautiful cathedral. 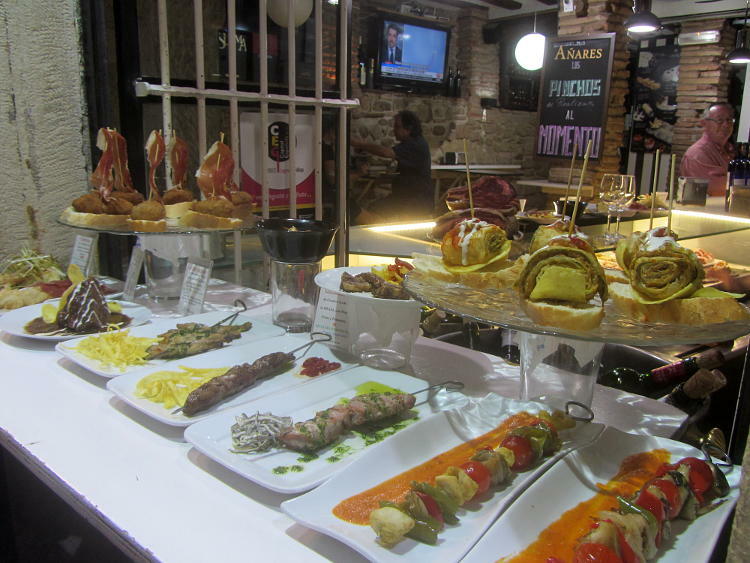 We stayed in Pensión Entreviñas", a boutique pension in the heart of the old town nestled in the narrow warren of streets which is home to the city's tapas or pinchos bars. 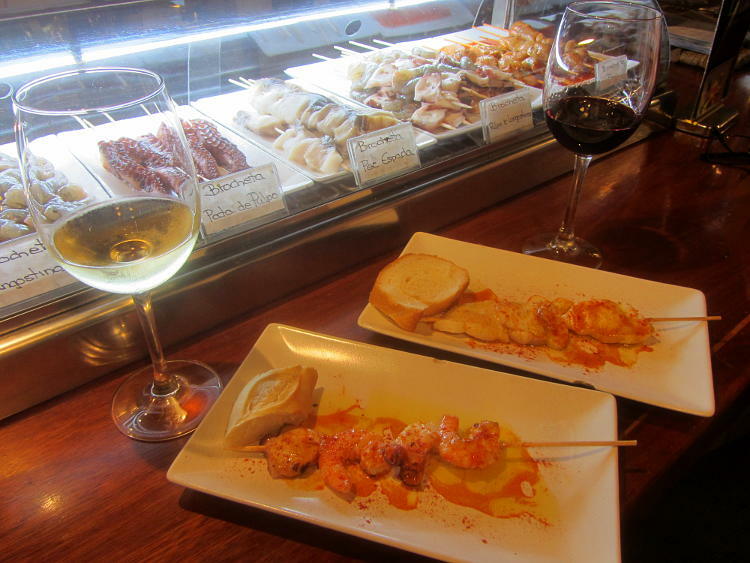 We found the bars here less touristy than their more famous cousins in San Sebastian and therefore much cheaper but also much friendlier and of course the pinchos were just as delicious! 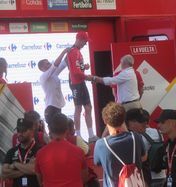 From Legrono we headed north, crossing into France near San Sebastian and then East on the A64 motorway which skirted the French Pyrenees. The weather wasn't great so the low cloud obscured any views of the mountains. 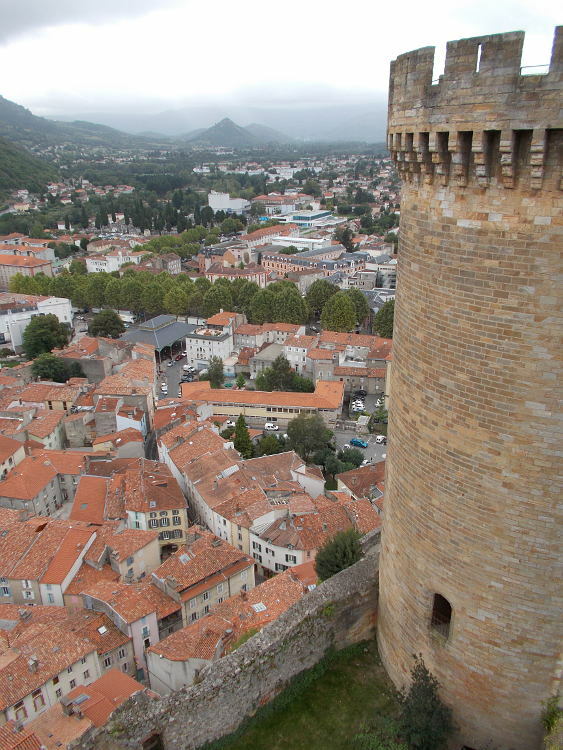 However, before too long we were at our next destination: Foix, the smallest departmental capital in France. 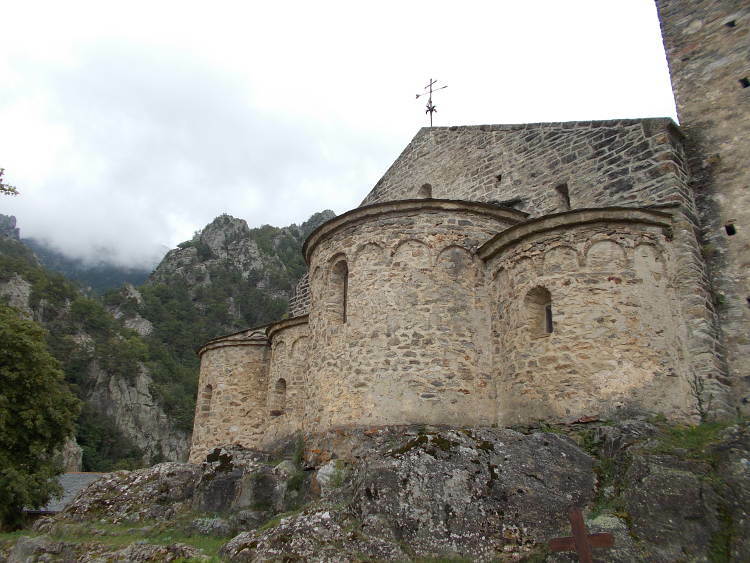 We booked into the Hotel Pyrene on the outskirts of town. On another day the swimming pool would have tempted us but not today. 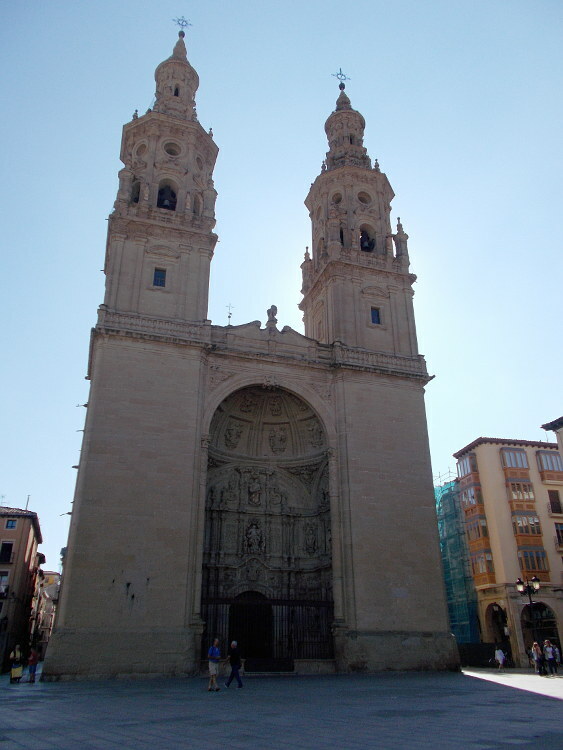 Dominating the town are the three distinctive towers of the castle, so that's where we headed. 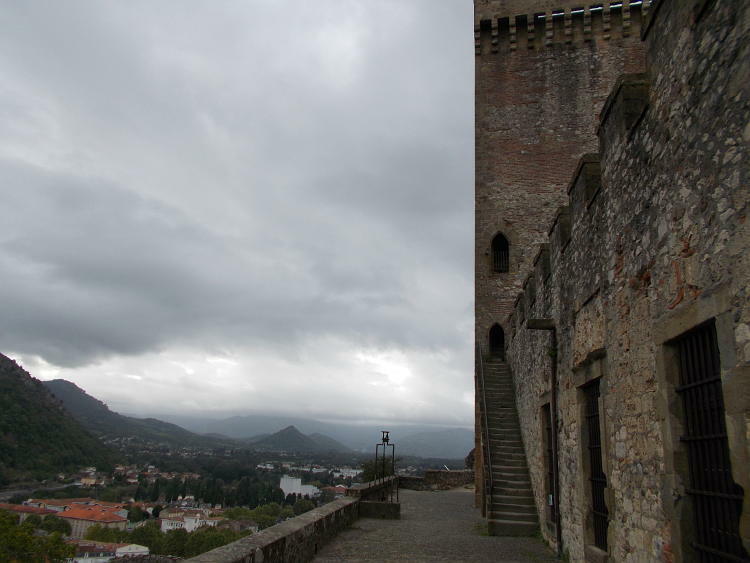 It was a bit of a climb but the views are great and the castle itself is quite interesting containing a few small exhibitions, about the building of the castle and medieval hunting. 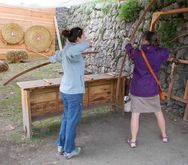 They also have a small area where you can try your hand at archery. Below the castle the old quarter is small and compact with many half-timbered buildings. By the end of the day it had actually warmed up a bit so we managed to dine outside in one of a cluster of restaurants in Rue de la Faurie, the tiny touristic heart of the city. Pretty good food as well as you would expect. 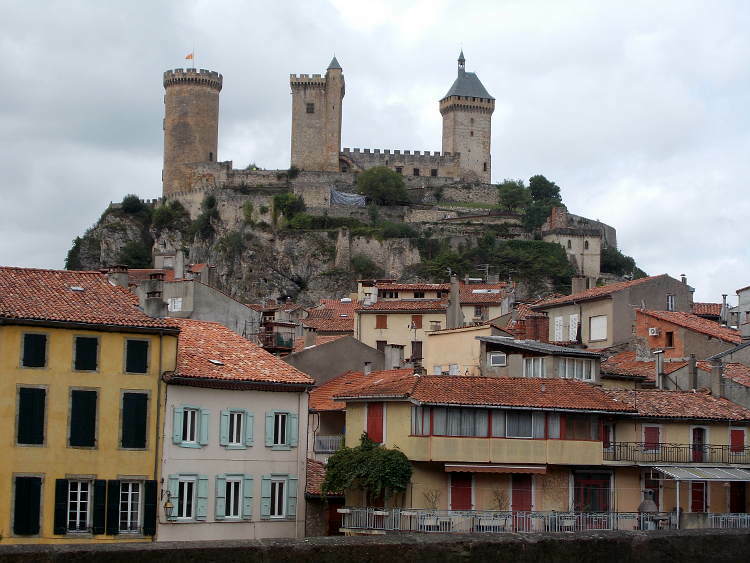 On our second day in Foix we headed out of town, firstly to the achingly attractive village of Mirepoix. 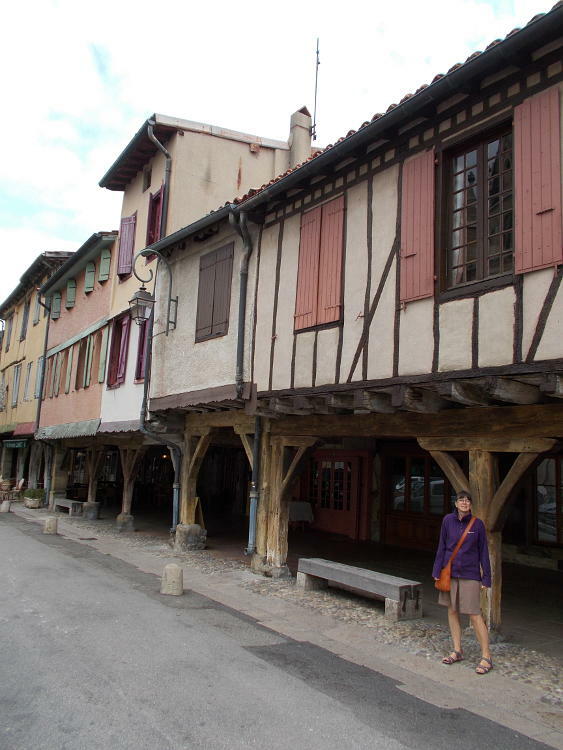 At the heart of Mirepoix is one of the finest surviving arcaded market squares in France. 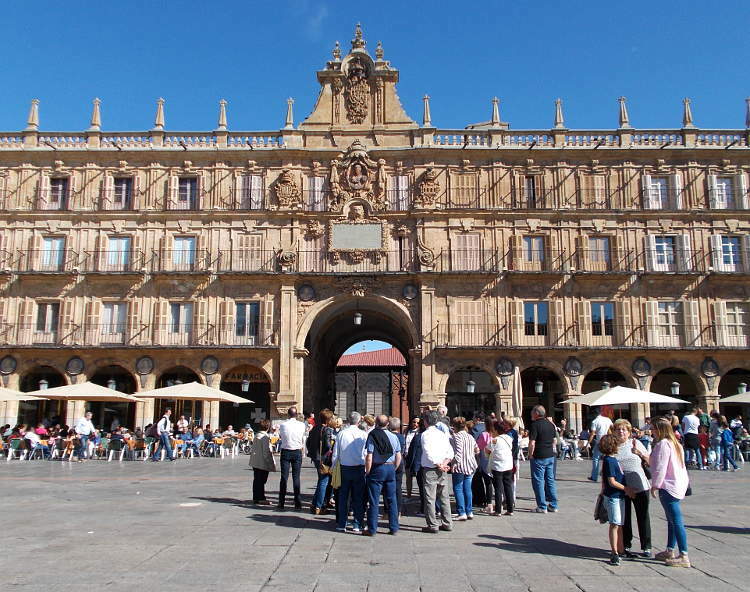 The square is bordered by houses dating from the thirteenth to the fifteenth centuries. Of course now, most of them have been converted into restaurants. Most of their occupants were English tourists, which was interesting in that nearer the Pyrenees the majority of tourists we saw were French. After a very pleasant lunch we headed back towards Foix but made a detour to the Underground River of Labouïche. 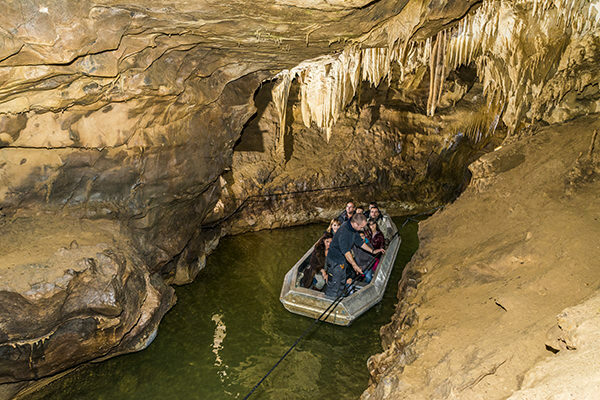 Apparently the longest navigable underground river in France, it was discovered in the early years of the 20th century and has been open to tourists since 1934. 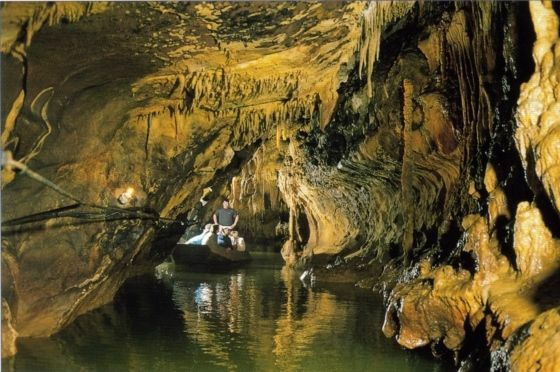 I have to say, I for one would not have come down here exploring in the pitch dark not knowing how narrow the caves were or how deep the water, but nowadays it's a very pleasurable experience gently floating down the river in a tin boat and gazing at the various rock formations and stalactites. 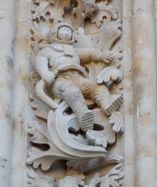 Strangely, photographs are not allowed but below are a few I managed to purloin from their website. 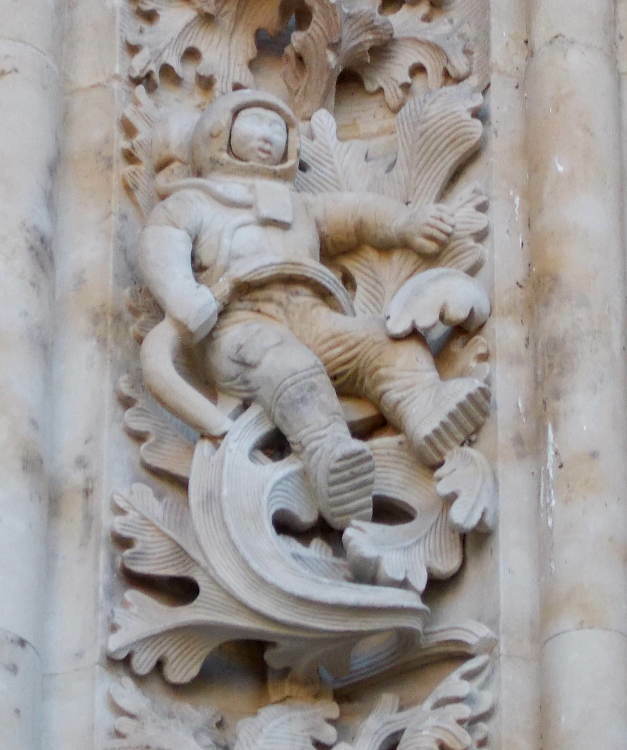 From Foix, off again east. 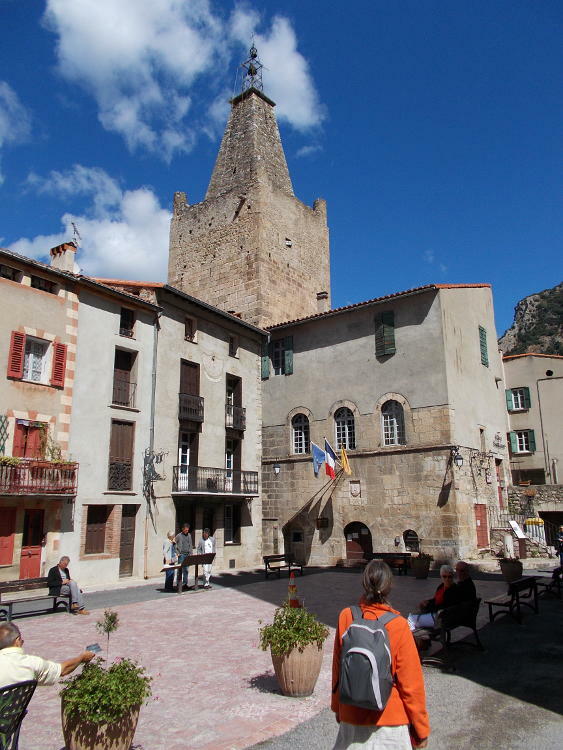 We stopped off high in the Pyrenees at the pretty resort town of Ax-Les-Thermes mainly because our visit coincided with "Le Festival des Saveurs" and we do enjoy markets and sampling local goodies. It was very similar to ones in Portugal with a variety of local produce namely honey, cheese, sausages etc but also craft beer which seems to have exploded in popularity in France, Spain and Portugal. We also met a number of people dipping their feet in the (very!) 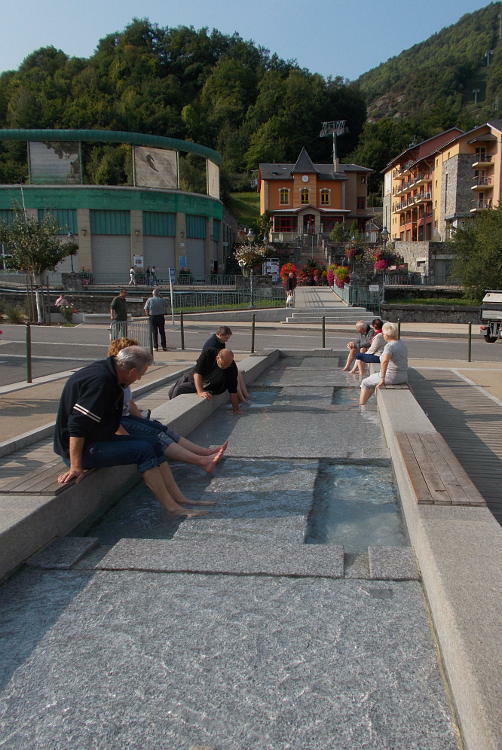 hot water springs in the middle of town. 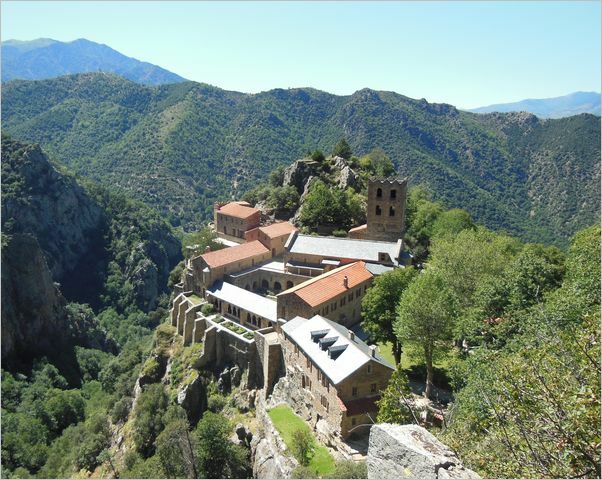 After this short pit-stop we were off again, up into the high mountains skirting Spain and Andorra and then down the Tet valley to our next destination, Prades, or rather a campsite a few kms outside in the small village of Casteil called Camping Domaine St. Martin. 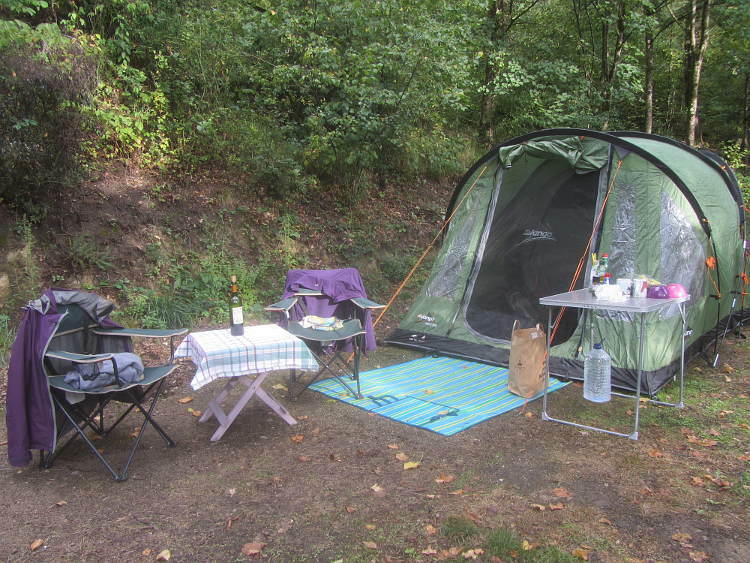 It was a great little find, just the sort of campsite we like, secluded in a forest but with restaurant/bar area. What we didn't realise was that at 700m above sea level it gets very cold at night even in September! Anyway, that was our base for the next 3 days. 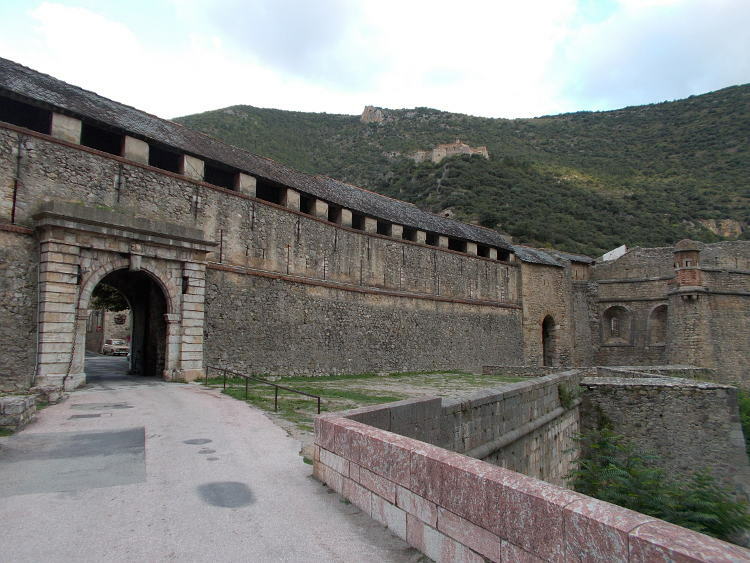 One of the highlights of the area is the World Heritage Site and walled city of Villefranche de Conflent. 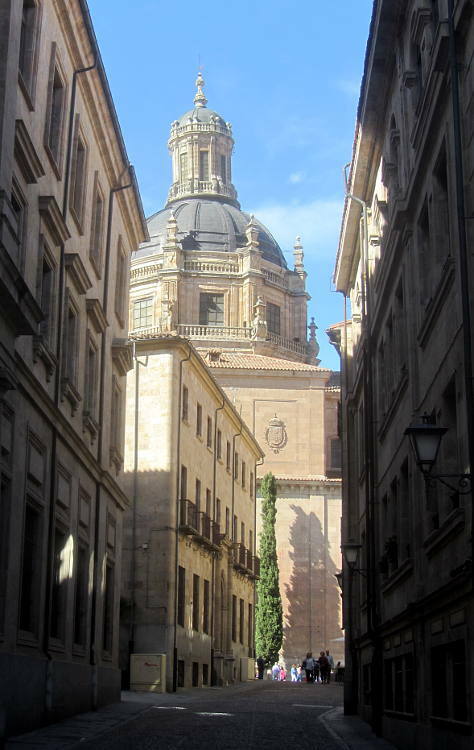 Situated in a narrow gorge, with huge defensive fortifications and narrow cobbled streets, it is still very attractive but unsurprisingly it has succumbed to tourism and the ancient buildings are now mainly used to sell tourist tat. Nearby is the start of the famous Yellow train line. 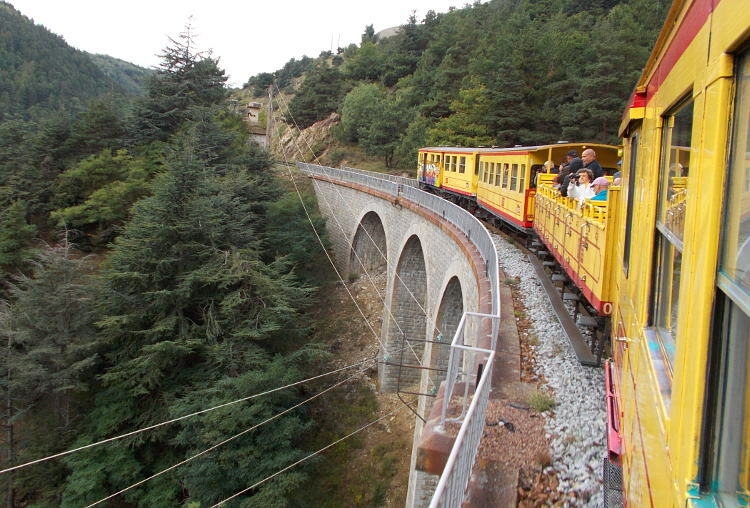 So one morning we got on board to retrace our steps up the narrow Tet valley back towards Andorra but this time on a narrow gauge railway line. 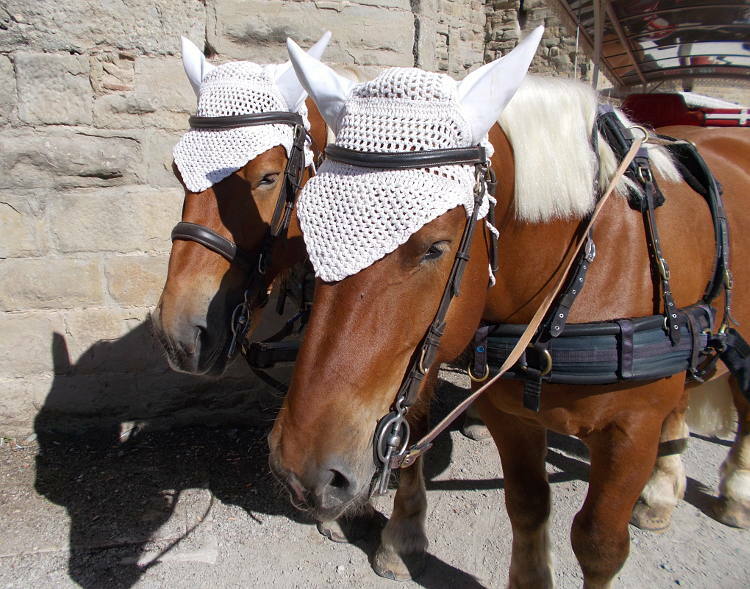 We had decided to take the enclosed carriage rather than the open top which was just as well because we encountered a few cold showers and biting winds as we slowly wound our way up, and then back down the valley. Unfortunately outside peak tourist season i.e. July and August, there is a restricted service of only a few trains up and down per day so we didn't even get off at the top, anyway, pleasant views were the order of the day. 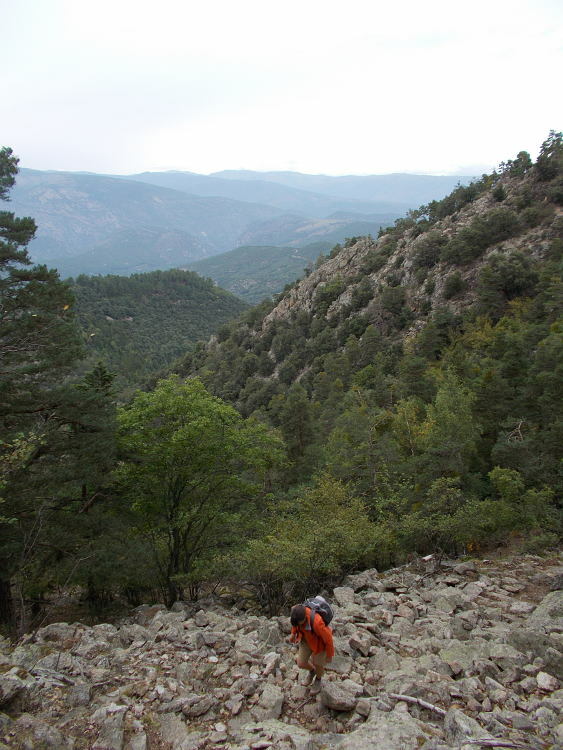 One of the things we always want to do on our holidays is a bit of hiking. 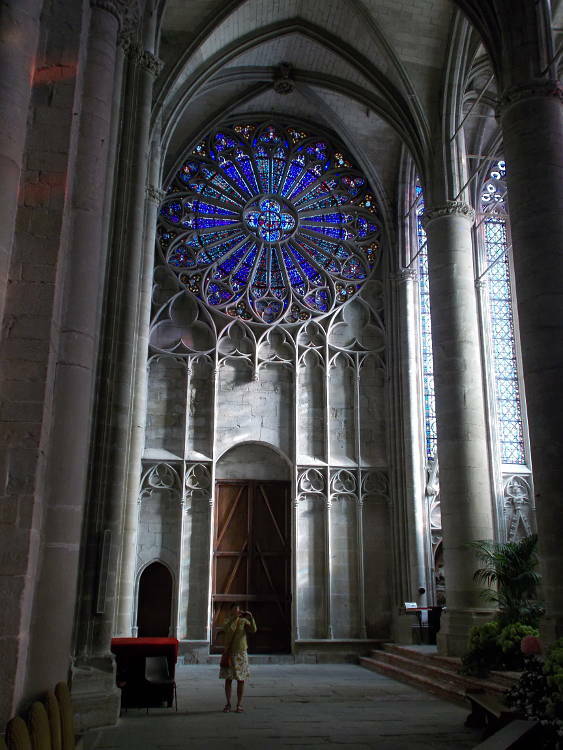 In our experience, France is well set up in this regard having plenty of marked trails and easy to obtain descriptive leaflets. 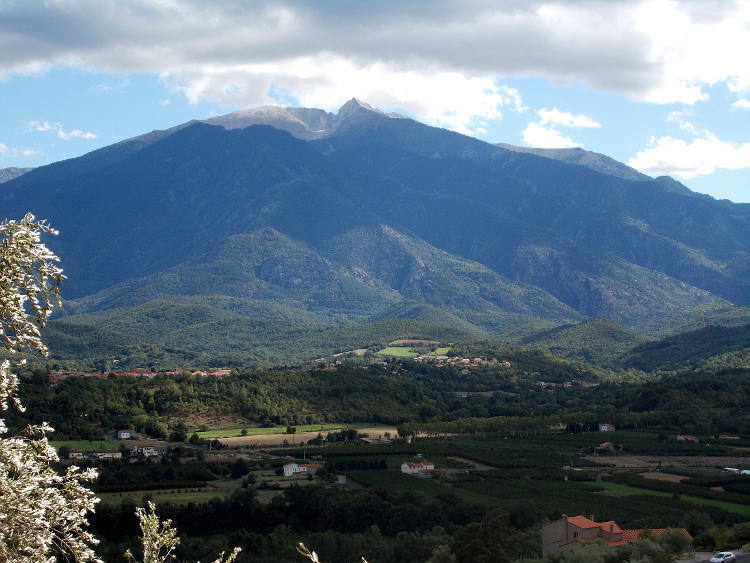 We were fortunate that one such trail left from our very campsite up the side of the biggest mountain in the area, the Pic du Canigou, and ending at the isolated Abbaye St. Martin du Canigou. It was a bit of a scramble on narrow tracks in a pine forest but a worthwhile couple of hours with great views down into the valley. 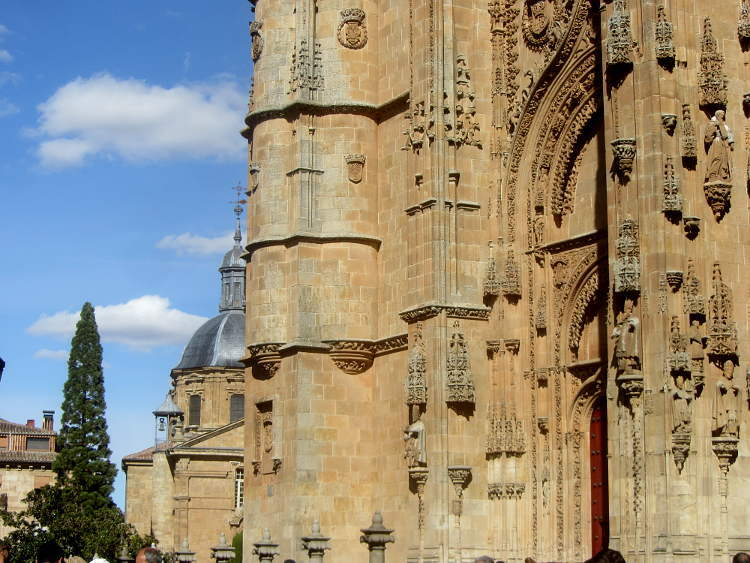 As it is a still functioning Abbey, you can visit but only on a guided tour. 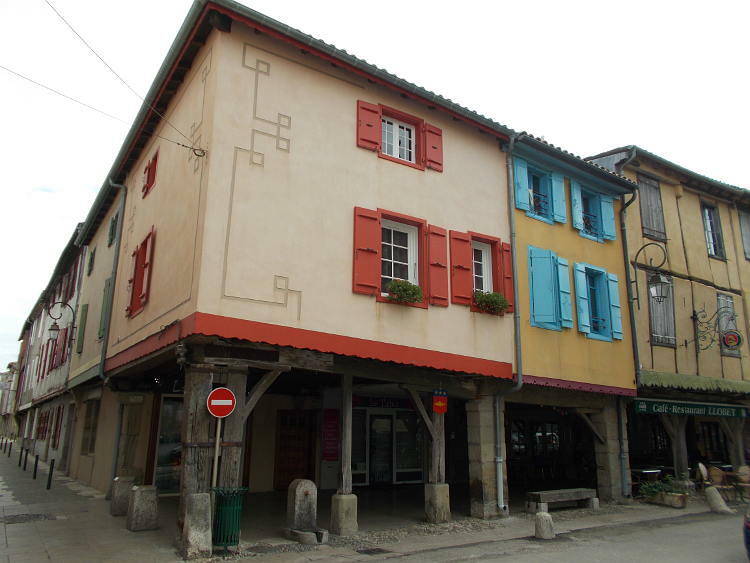 Unfortunately we had just missed one and as the weather was closing in we quickly scampered on down towards the village of Casteil for lunch, as we knew it had three restaurants. However, being September, and outside tourist season, they were all closed. By now the rain had arrived but we were able to get to the campsite fairly dry. 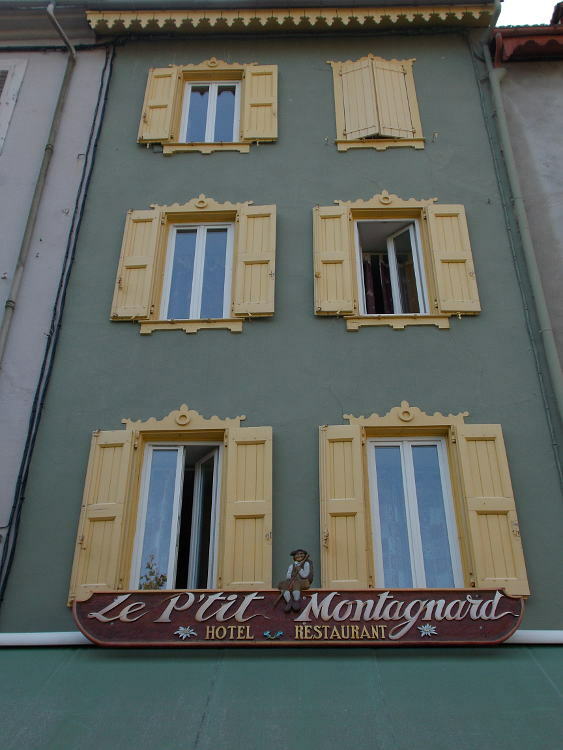 And here we were very pleased to see that their restaurant was open, with just one thing on the menu - Confit du canard and it was absolutely delicious! Apart from the odd brief shower this was the only rain we had the entire holiday. 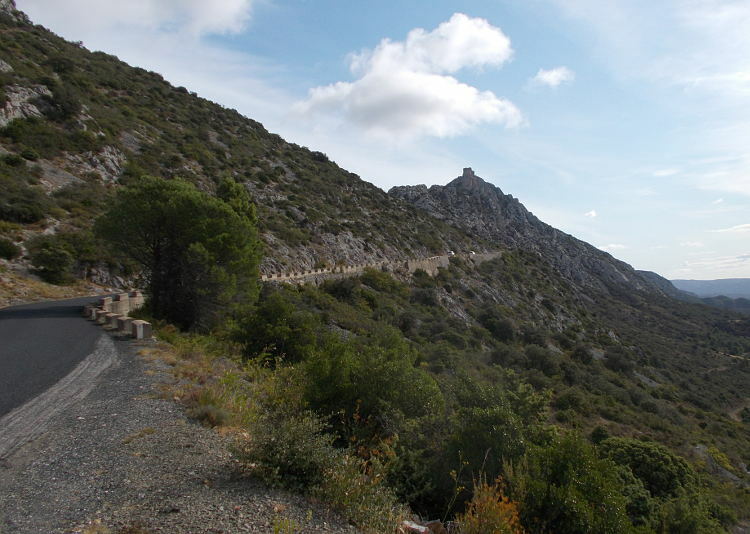 The next day was bright and sunny so we decided to head to the Vermillion coast, a very attractive stretch running south of Perpignon to the Spanish border. 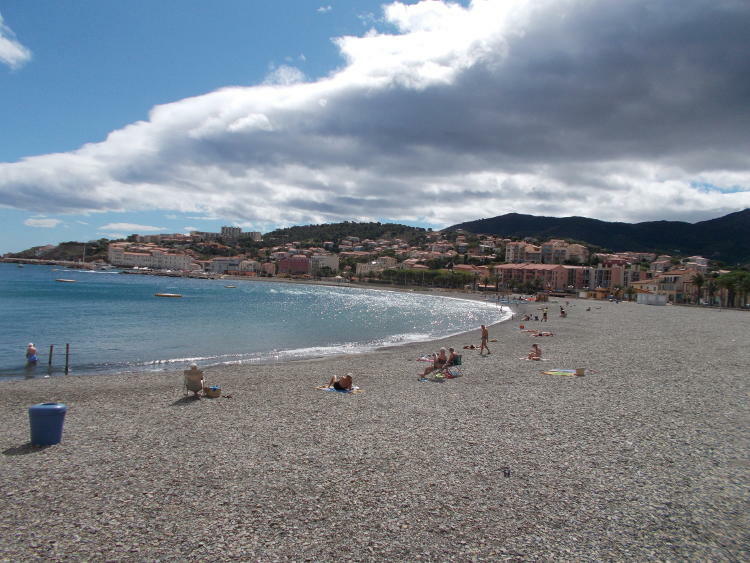 Jackie was rather disappointed that the beach at Banyuls sur Mer was pebbly but it didn't deter me and I joined a collection of old souls in the beautiful clear water. 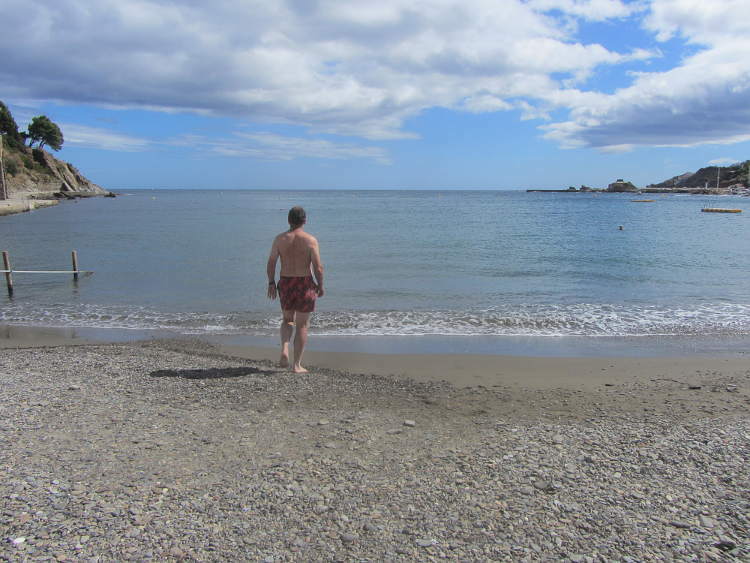 After the frigidity of the Portuguese Atlantic it was a welcome relief to bathe in the relatively warm Mediterranean. Ahhh! 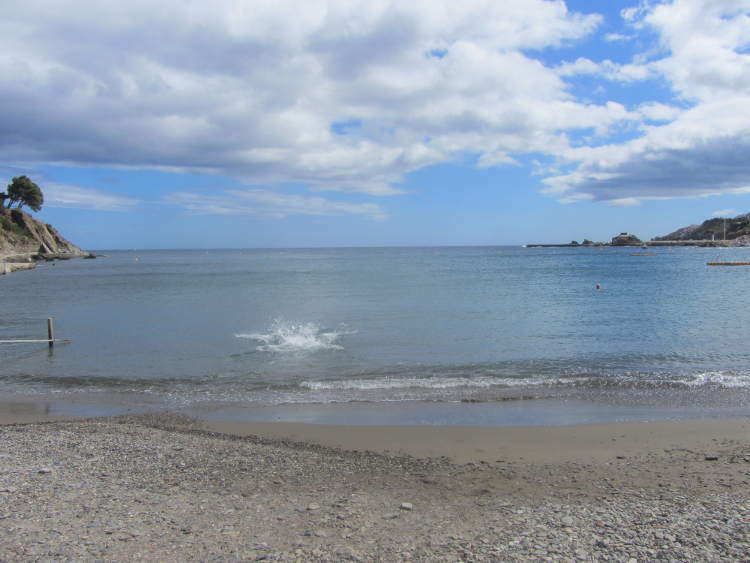 We had planned on lunch in the most beautiful town of the coast, Collioure, but so, it seems had everyone else and there were no parking spots for miles around especially as we were in our large Portuguese Hilux truck. 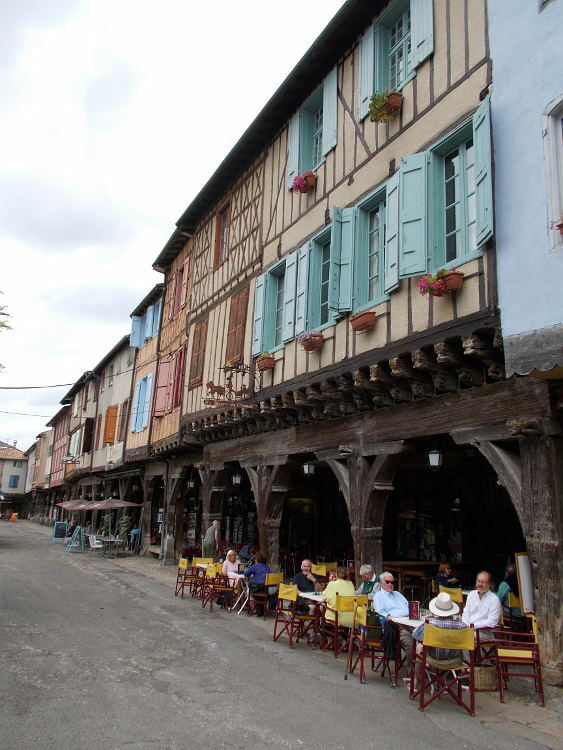 Places along the coast north were not to our liking so reluctantly we headed back inland thinking we could stop at a small town on the way home, perhaps eating alfresco in some charming square. Alas no. It was 2pm and so everything was closed. As a last resort we grabbed a sandwich at a supermarket and bought some provisions for an evening campfire treat. 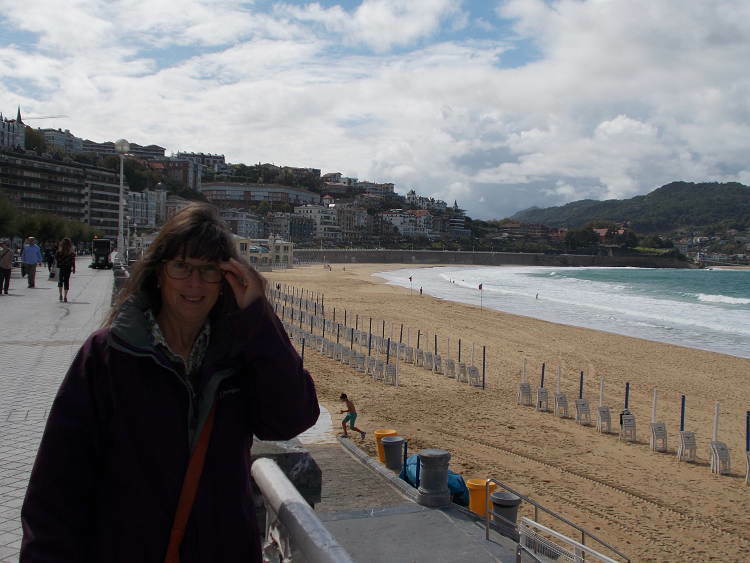 Our Pyrenean sojourn was at an end but not the holiday. 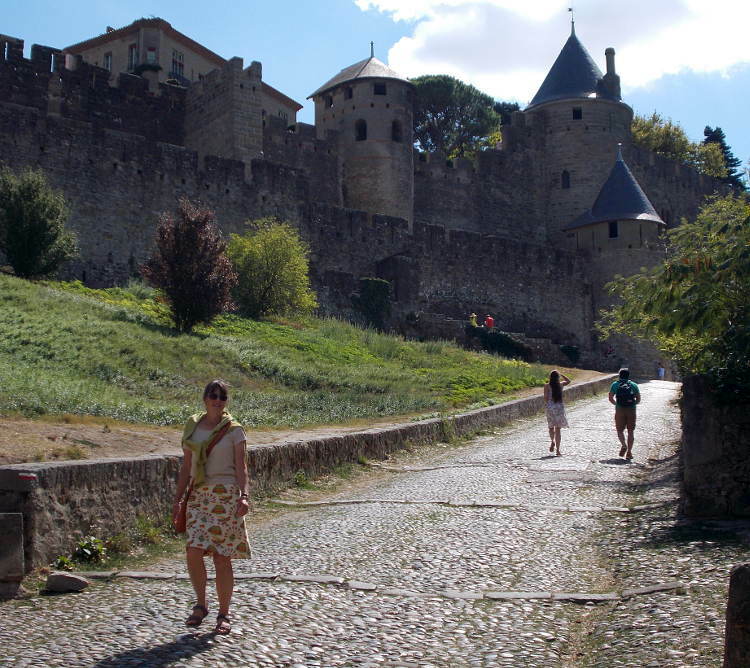 For our final destination we headed north to the walled city of Carcassonne. We had decided to take the scenic route and headed due north. It was certainly different. 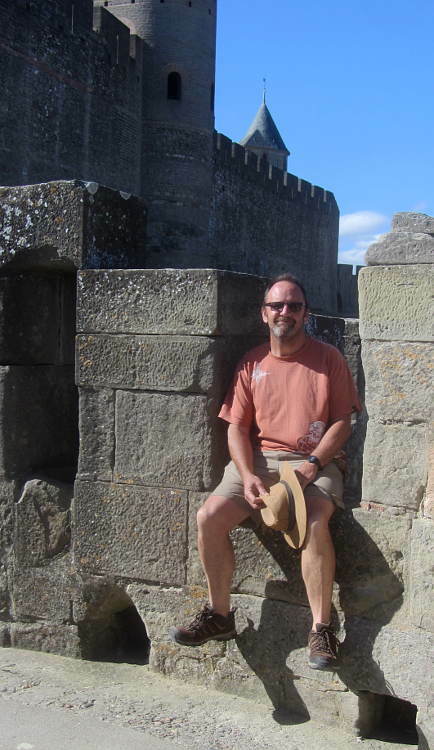 Windy narrow raods, windswept ledges and isolated villages greeted us until we arrived at the small town of Trebes. 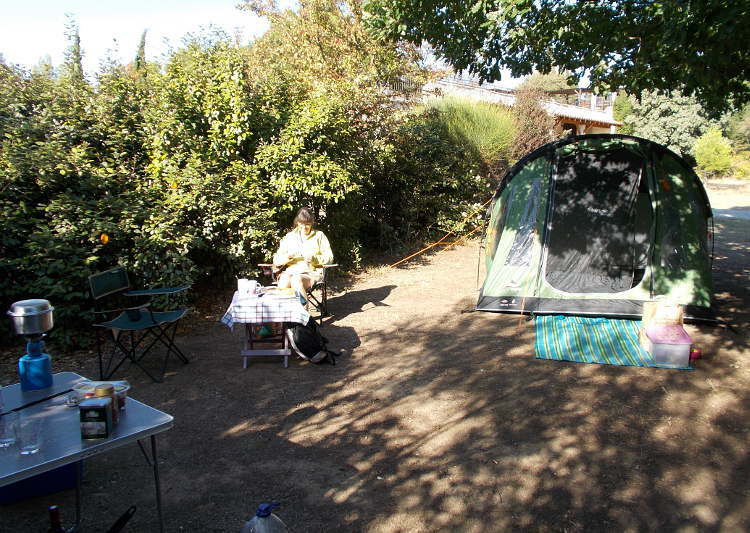 This picturesque place straddles the Aude river and the Canal du Midi. There were a cluster of restaurants on the canal where we had a very nice seafood lunch before heading to our designated campsite a few miles away. 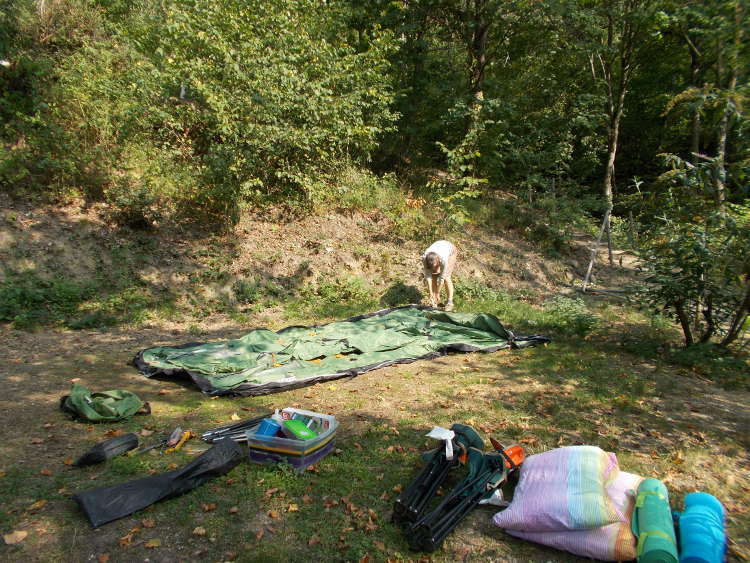 We were very surprised that Camping La Commanderie was packed, as September is certainly outside French peak holiday season but we managed to find a large and quiet spot to pitch our tent. 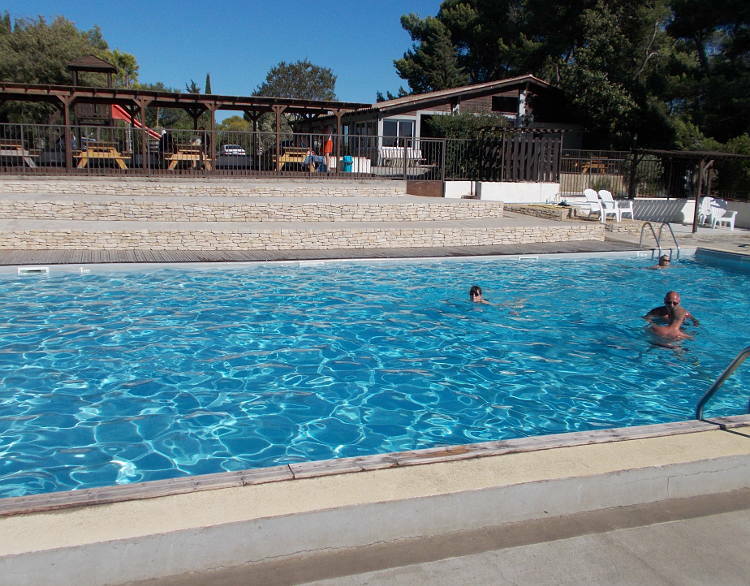 The weather had remained fine as well so a very welcome dip in their large swimming pool was the order of the day and this time Jackie braved the water. The next morning we were up bright and early as we knew Carcassonne would be packed and we wanted to enjoy a semblance of quiet there before the tour buses arrived. 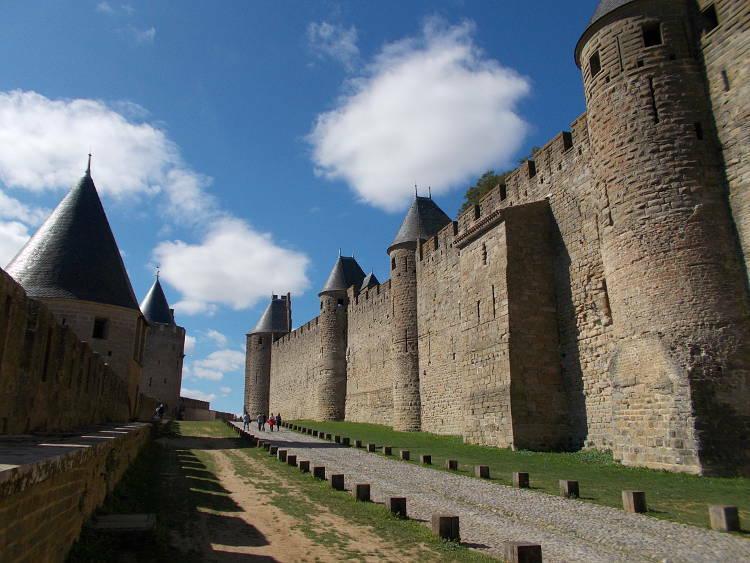 It is an amazing place, the walls are magnificent and you can picture the backdrop to many medieval joustings. 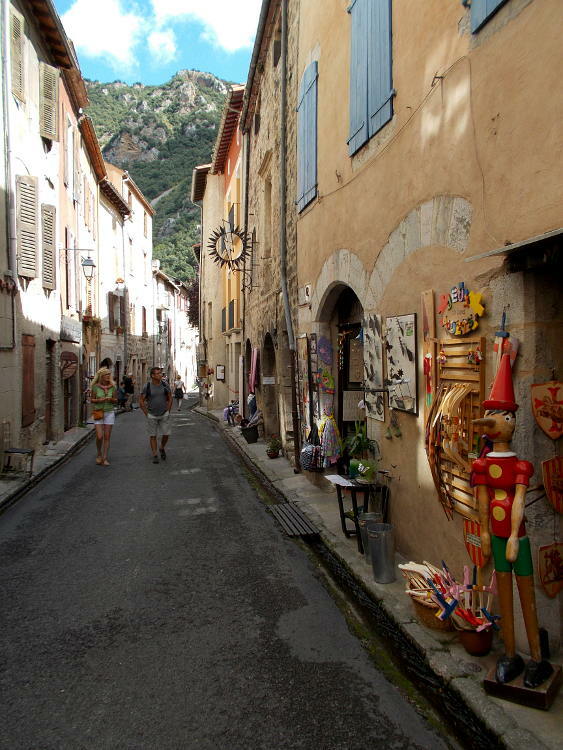 Of course the old streets are full of tourist shops and restaurants but it certainly doesn't demean the place. 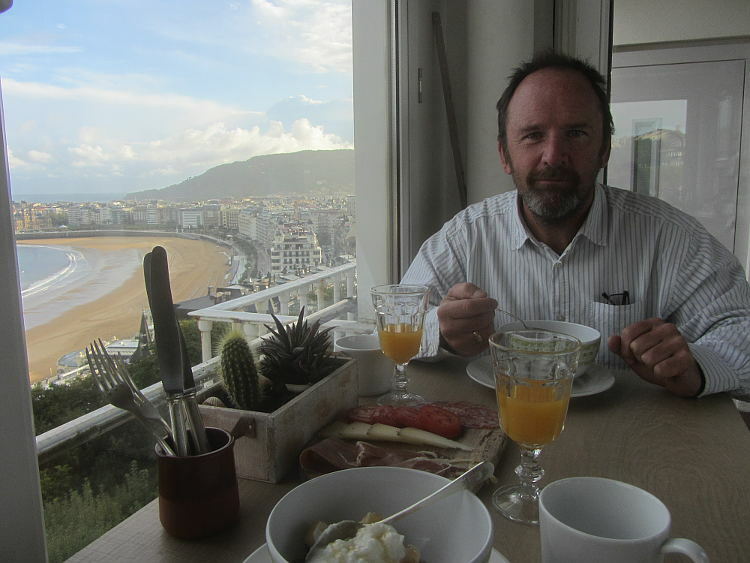 We knew it was a gastronomic as well as historic city so we decided to splash out on a special lunch. The restaurant Comte Roger certainly didn't disappoint, as the Michelin guide says, "Fine hospitality and cuisine, which is modern yet timelessly dignified." 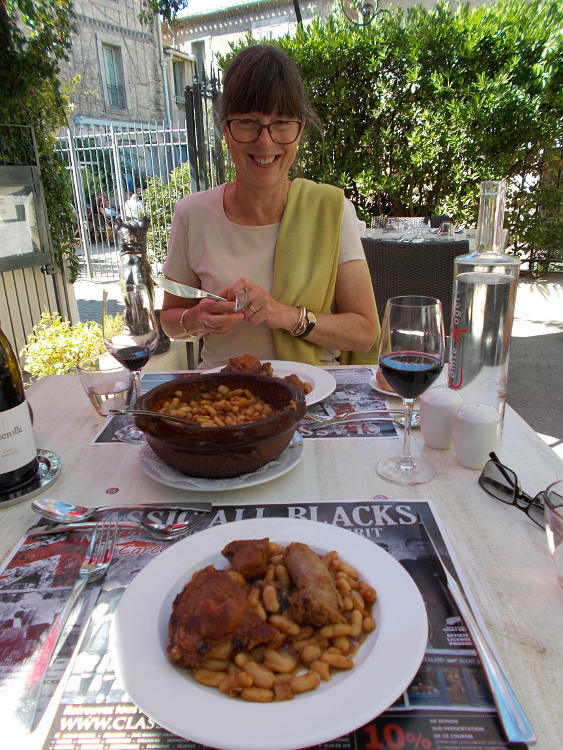 Despite the warm day we had the regional speciality, Cassoulet, a slow cooked casserole of pork, duck and white beans. 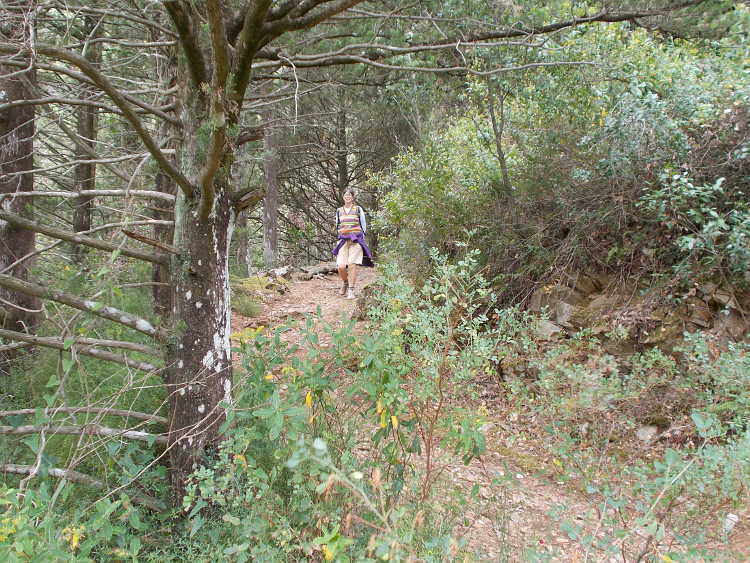 We also managed to fit in one last hike while we were here as well, starting from the small town of Caunes Minervois. 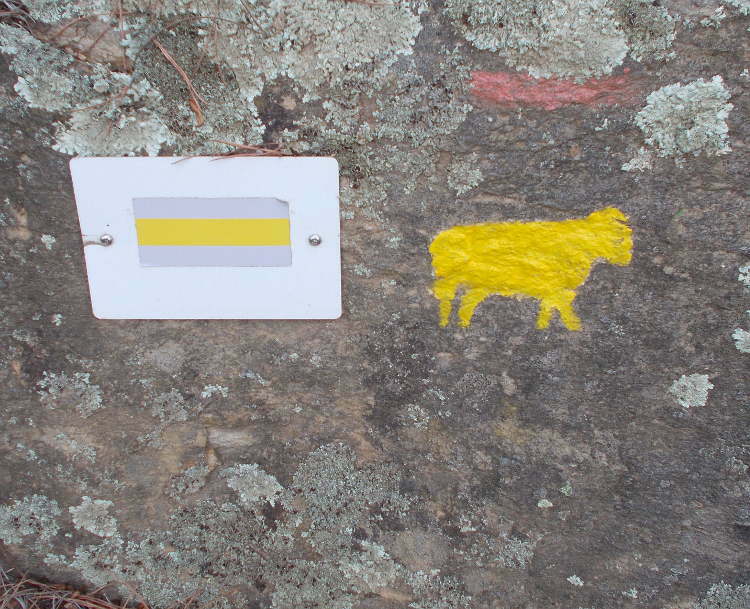 The walk even had a name: La Route des Moutons, a very pleasant 3 hour walk. 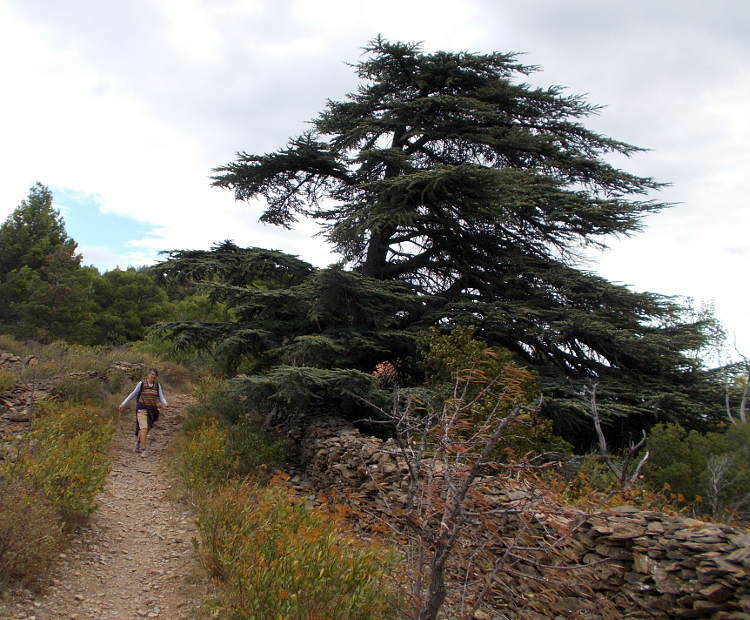 Although over 1000km away, we noted the flora was very similar to that near our house in Portugal - lots of Maquis vegetation with holm oaks, pines and similar hardy shrubs. The walk also had the added bonus of a couple of geocaches which we are always keen to find. After the walk we were directed to a great little restaurant in the town, La Table d'Emilie, which served an excellent lunch. We were rather surprised to find that in the heart of French gastronomy country the chef was English! We also bought a few bottles of excellent local French wine while we were here. 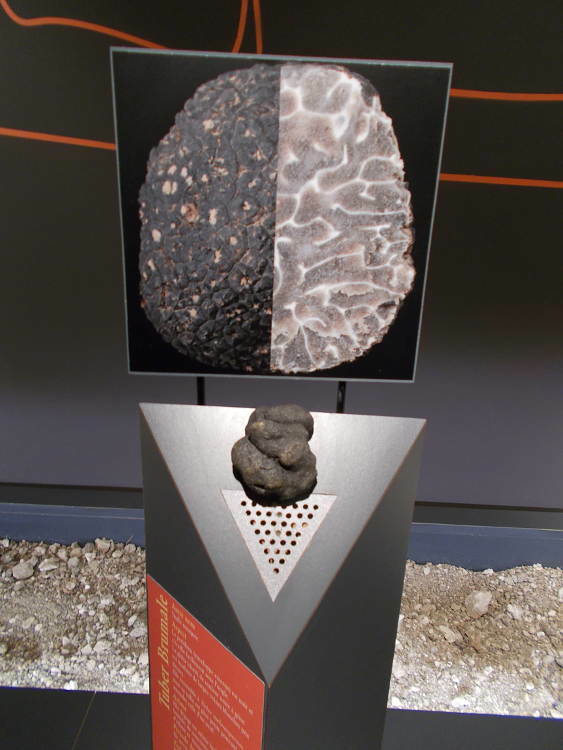 On the way back to the campsite we also found the House of Truffles, an interesting little museum dedicated to all things truffles, with an illustrated history of truffling, what they actually are, and amongst other things an interactive display enabling you to whiff the aromas of various truffles. 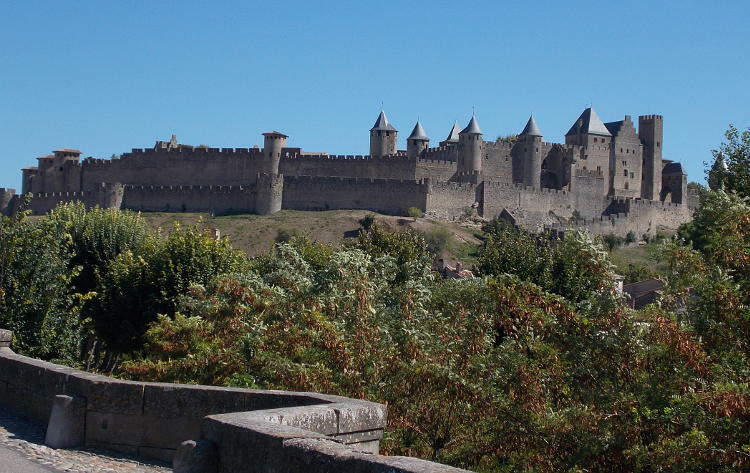 So after driving well over 1500kms to get to Carcassonne, all we had to do now was get home. For this we made two stops. 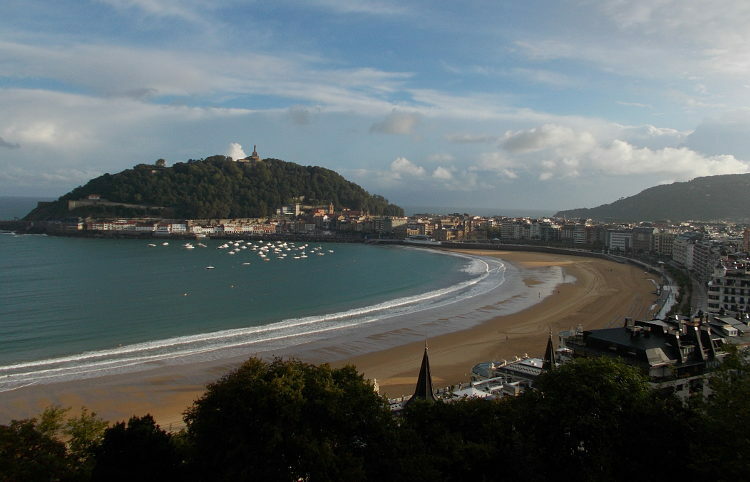 The first was San Sebastian where Jackie was to meet a very old friend she hadn't seen in 20 years! 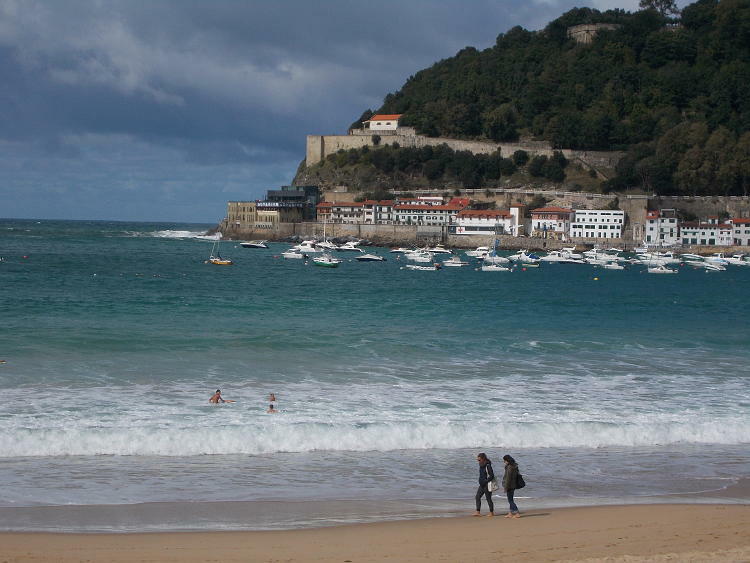 We were also pleasantly surprised that in contrast to our last time here the weather was much better. Not that warm, although it certainly didn't deter some hardy souls who were swimming, but sunny. 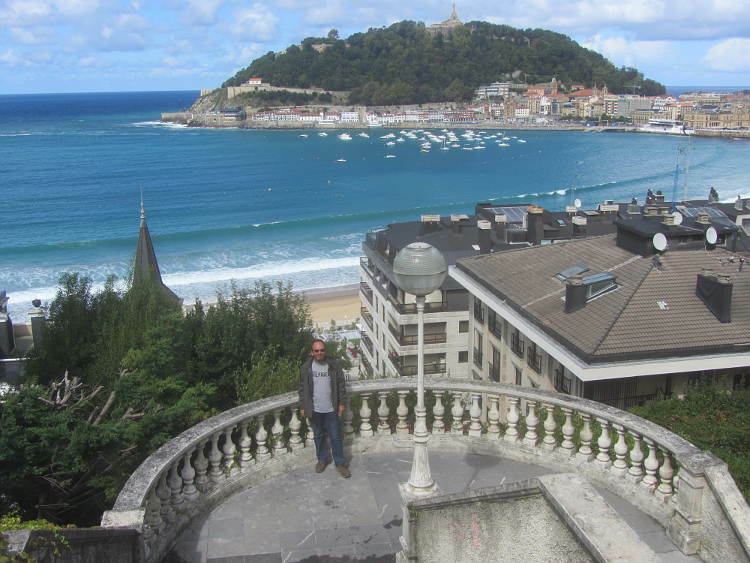 We also stayed in a quirky hotel, the Far Out Inn, which had an excellent view over La Concha, the famous San Sebastian beach. 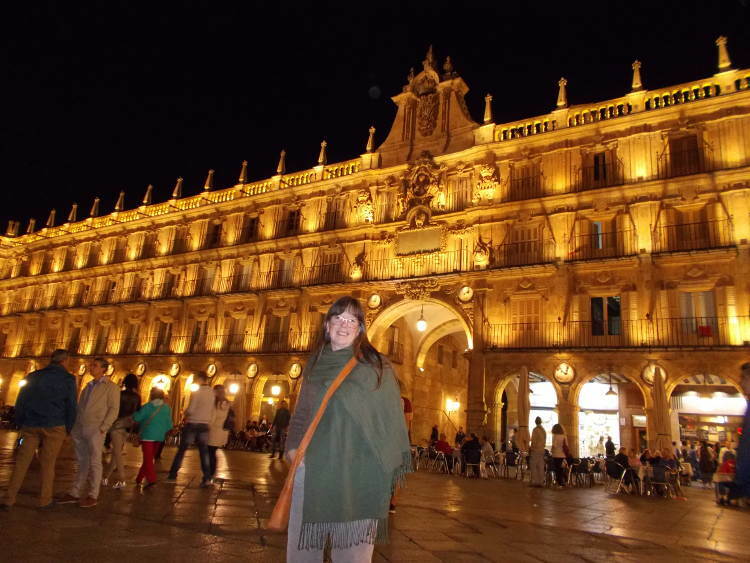 Just one night there and then our final night returning to an old favourite, Salamanca, where we visited way back in 2011. So, 13 nights away and 3300 kms later we arrived back home safe and sound.